PESTCommander is an object-oriented Graphical User Interface (GUI) written in Python® that facilitates the management of model files ("file management") and remote launching and termination of slave computers across a distributed network of computers ("run management"). In version 1.0 described here, PESTCommander can access and ascertain resources across traditional Windows local area networks (LANs). Version 1.0 of PESTCommander was developed primarily to work with the parameter estimation software PEST, a widely used parameter estimation code, and the newly developed parameter estimation code PEST++ run in conjunction with the general run manager GENIE. PESTCommander is a Graphical User Interface (GUI) that allows a modeler to load, start, stop, and clean, slave computers used for PEST and PEST++ parallel processing on a local area network (LAN). What are some of the limitations of PESTCommander? PESTCommander only accesses computational resources located on a Local Area Network (LAN); Wide Area Networks (WANs) and Cloud Computing are currently not supported. Only the Windows® platform is supported. As PESTCommander is developed further, it is expected that the capabilities will increase. Will PESTCommander work with PEST? Yes, with Parallel Pest (ppest.exe). PESTCommander stores information in Parallel PEST's "run management file" (*.rmf) format. Will PESTCommander work with PEST++? Yes, when the GENIE run manager is installed and the PEST++ control file contains: 1) the GMAN_Socket keyword; and 2) IP Address and port number of the GENIE run manager. Are the capabilities of the global run manager GENIE fully integrated within PESTCommander? No, GENIE capabilites are partially integrated in version 1.0 of PESTCommander. PESTCommander provides a list of available slave computers and their shared folders, allows remote launching and termination of GSLAVE programs on selected slaves, and allows the launch of the GENIE run manager GMAN application on the host computer. Before starting slaves, the user needs to enter the necessary GENIE communication parameters: these are the IP address used for communication between GLSLAVE and GMAN, port number, and interval, all of which are described by Muffels and others (2012). By default, the PESTCommander GUI will use the IP address of the computer where the GUI is started, although the user can use any active IP address in the network. Doherty, J., 2010a, PEST, Model-independent parameter estimation-User manual (5th ed., with slight additions): Brisbane, Australia, Watermark Numerical Computing. Doherty, J., 2010b, Addendum to the PEST manual: Brisbane, Australia, Watermark Numerical Computing. Muffels, C.T., Schreüder, W.A., Doherty, J., Karanovic, M., Tonkin, M.J., Hunt, R.J., and Welter, D.E., 2011, A model independent TCP/IP run manager, inMODFLOW and More 2011: Integrated Hydrologic Modeling, Proceedings of the 10th International Conference of the International Ground Water Modeling Center. Golden, CO: Colorado School of Mines. Welter, D.E., Doherty, J., Muffels, C.T., Tonkin, M.J., Hunt, R.J., Schreüder, W.A., and Karanovic, M., 2011, Lowering the Barriers of Entry to Inverse Modeling: PEST++, in MODFLOW and More 2011: Integrated Hydrologic Modeling, Proceedings of the 10th International Conference of the International Ground Water Modeling Center. Golden, CO: Colorado School of Mines. Welter, David E.; White, Jeremy T.; Hunt, Randall J.; Doherty, John E.
Welter, D.E., White, J.T., Hunt, R.J., and Doherty, J.E., 2015, Approaches in highly parameterized inversion— PEST++ Version 3, a Parameter ESTimation and uncertainty analysis software suite optimized for large environmental models: U.S. Geological Survey Techniques and Methods, book 7, chap. C12, 54 p., http://dx.doi.org/10.3133/tm7C12. Welter, David E.; Doherty, John E.; Hunt, Randall J.; Muffels, Christopher T.; Tonkin, Matthew J.; Schreuder, Willem A. 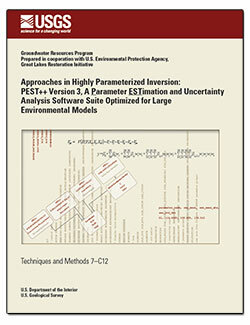 Approaches in highly parameterized inversion - PEST++, a Parameter ESTimation code optimized for large environmental models; 2012; TM; 7-C5; Welter, David E.; Doherty, John E.; Hunt, Randall J.; Muffels, Christopher T.; Tonkin, Matthew J.; Schreuder, Willem A.
Muffels, Christopher T.; Schreuder, Willem A.; Doherty, John E.; Karanovic, Marinko; Tonkin, Matthew J.; Hunt, Randall J.; Welter, David E.
Approaches in highly parameterized inversion - GENIE, a general model-independent TCP/IP run manager; 2012; TM; 7-C6; Muffels, Christopher T.; Schreuder, Willem A.; Doherty, John E.; Karanovic, Marinko; Tonkin, Matthew J.; Hunt, Randall J.; Welter, David E.
Doherty, John E.; Hunt, Randall J. 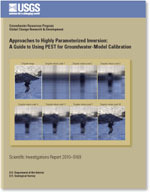 Approaches to highly parameterized inversion-A guide to using PEST for groundwater-model calibration; 2010; SIR; 2010-5169; Doherty, John E.; Hunt, Randall J.